Let's see, now: In the first part of the opera a blood-soaked violinist dies from gunshot wounds and a child's father is casually murdered by a self-centred, red-haired woman provocatively dressed in matching lingerie. In the second part, a captain allows the surviving mother and her child aboard a refugee ship only if she agrees to sleep with him. In the third part, the ghost-like ship is refused landing rights on a forsaken island and the child chooses certain death by refusing to be parted from his mother. And in the fourth part, the mother adds her child's body to a chorus of similar child corpses, all of them expecting resurrection from a messiah, who turns out to be a travelling salesman. Blame the depression and despair on the late Hanoch Levin, arguably Israel's greatest playwright, one of whose most famous works has been only slightly trimmed to form the libretto of this brave addition to the operatic literature. Nine years ago, I reviewed the premiere of Shohat's first opera, Alpha and Omega, a retelling of the Adam and Eve story, a work also commissioned by the Israeli Opera and mounted on the stage of Tel Aviv's handsomely modern (and Israel's only) opera house. Back then, the Israeli-born composer was a precocious 26-year-old, anxious to show off his skills. The new score finds him writing in a less self-conscious, more lyrical and listener-friendly manner (one scene sounding almost like a paraphrase of Ravel's "La Valse"). "Friendly" may seem an odd word to describe such a savage study of the contrast between the hopeful dreams of childhood and the realities of adult human behaviour, but music often softens harsh truths and Shohat's, with its sometimes soaring vocal lines for the mother and child, is no exception. An opera bound for the international circuit? More likely so than Alpha and Omega, perhaps, especially if David Stern (violinist Isaac Stern's son) conducts, Omri Nitzan directs, if the cast includes soprano Ira Bertman as The Mother and soprano Hila Baggio as The Child, and if Gottfried Helnwein's sets and costumes continue to be used. Helnwein's realization of the final scene takes the breath away: a view of dozens of bloodied children's bodies, some of them hanging (dummies), some of them turning over and over (acrobats) in mid-air, as a vocal ensemble sings their words while kneeling on stage. Although Shohat denies that The Child Dreams is a Holocaust opera, rightly pointing out that its themes are universal, the parallels are strikingly obvious and unsettling. These parallels give The Child Dreams a particular resonance in Israel, where Tel Aviv audiences have been both large and responsive. Whether these same parallels will foster or hinder the Hebrew-language opera's exportability is question begging to be answered. The handsome Tel Aviv production helps mark the 25th anniversary of the Israeli Opera, a company with 17,000 subscribers and a 97 per cent average attendance in a country with a very recent operatic tradition. That tradition has yet to embrace Richard Wagner, the German composer's adoption by the Nazis having left a psychic wound that has yet to heal, but it does embrace four operas and a musical specially commissioned by the Israeli Opera from Israeli composers, of whom Shohat is now the most operatically experienced. Stern, the company's new music director, argues that there is nothing unreasonably challenging in singing opera in Hebrew, one just has to combine the Italian technique for singing vowels with the German technique for consonants. Whether the daring subject matter of an opera such as The Child Dreams will be embraced by companies outside Israel may turn out to be the greater challenge. If the desire to be moved counts for anything, Shohat's new opera has at least a fighting chance. 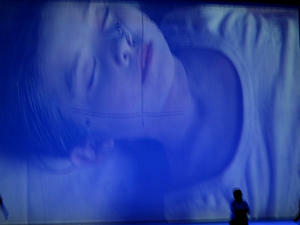 HELNWEIN'S VISUAL REALIZATION FOR THE OPERA "THE CHILD DREAMS"
One of the most important productions of the Israeli Opera's 25th anniversary season is the world premiere of the opera The Child Dreams, based on the most poetic and lyric play by the late Hanoch Levin, undoubtedly, one of Israel's greatest playwrights. With his stage design, costumes, make-up and videos, Gottfried Helnwein created a breathtaking and revolutionary new visual realization for that play. Together with director Omri Nitzan he developed a new conception for the adaption as an opera . Composed is the opera by Israeli composer Gil Shohat, and David Stern, the Israeli Opera's music director, is conducting this new opera featuring closed to 20 Israeli opera singers on the stage. Helnwein also included dancer and choreographer Gregor Seyffert who is in charge of the choreography. HELNWEIN'S VISUAL REALIZATION FOR THE "THE CHILD DREAMS"